New to Indianapolis, a Polish salt cave has been freshly formed in Benjamin Harrison State Park. 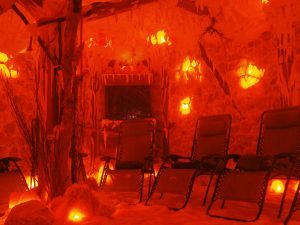 The Indianapolis Salt Cave and Halotherapy Center has created a microclimate of a Polish salt mine. In this cave you can find asthma relief, decrease in sinus infection, cold and influenza prevention, and best of all peace. 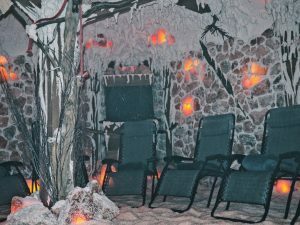 Salt caves offer a wide range of healing benefits and the Indianapolis Salt Cave is no exception. Salt is a antibacterial and antimicrobial compound. Inhalation of salt works to cleanse the body of any respiratory infections or diseases. People who deal with issues of thyroid problems, cough, asthma, allergies, etc can benefit from a healing session in the cave. In addition to the physical healing properties. The salt creates mental healing at a physiologically level. This pink polish salt works to create a calming, mood boosting environment due to the negative ions given off from the salt. Negative ions counteract the positive ions. Positive ions are present due to pollution, toxins, electronic devices and many everyday sources.. Positive ions induce feelings of anxiety, tension, and irritation. Think of how you feel at the beach. The feelings of ease and relaxation felt at a beach are partially due to the large amount of negative ions in the salty ocean air. Therefore, that same peaceful feeling can be experienced in a salt cave without a trip to the ocean or risk of a sunburn. My session at the Indianapolis Salt Cave was fabulous. I spent a 45 minute session snuggling with a cozy blanket in one of the many chairs in the salt cave. I really enjoyed listening to the peaceful music and sounds of water trickling. My favorite part of being in the salt cave was the glow from all of the salt rocks. The color the rocks create have such a unique essence and vibe. During my session I practiced different deep breathing exercises and then gave myself time to be still. It was really refreshing to unplug for 45 minutes out of day. After the session I felt a huge sense of ease and cleansing. 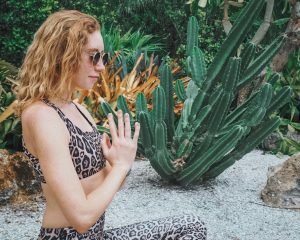 My body felt lighter and I was ready to take on the rest of my day with a more grounded mindset. 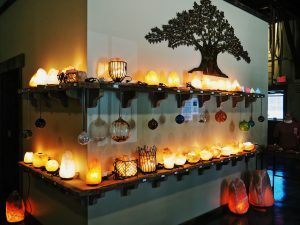 The Indianapolis Salt Cave and Halotherapy Center doesn’t just offer sessions in the cave. It is a complete wellness haven. They offer many services to get you feeling like your best self. 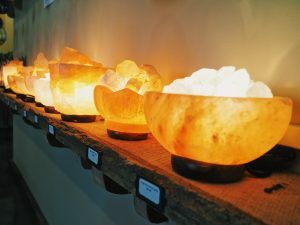 Their services include an infrared sauna, hand and foot detox, and lounging in a healing salt cave. Infrared Saunas are created to heat your body from the inside out. Infrared waves work to detox your cells, purify the skin, and increase circulation. The hand and foot detox is a service where you place each hand and foot on a heated himalayan salt rock. This service works to stimulate the entire nervous system, reduce muscle inflammation, and pull toxins out of the skin. As mentioned above, the salt cave offers a counterattack on positive ions, stimulating better mental well-being as well as an internal physical cleanse of body impurities. 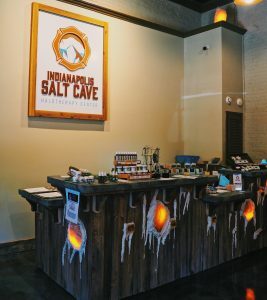 Don’t wait to try out the Indianapolis Salt Cave and Halotherapy Center! You deserve to treat yourself and start being the best you can be. It’s easy. It’s peaceful. It’s affordable. Check out their website for different prices for each of their services. 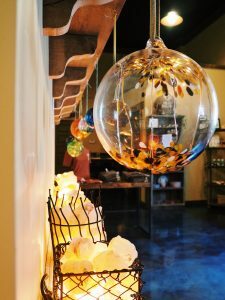 They offer monthly memberships, single sessions, and event / party sessions. Some insurance providers will be able to write off their services using flexible spending or health savings. Its best to check with your provider to see if this would be available for you.